Did you hear the bell ring this past Tuesday? If you didn’t, don’t feel cheated! Tuesday was the six year anniversary of the “bottom” of the bear market when prices reached their lowest point. On March 9, 2009, the value of the S&P 500 Index bottomed out at 677. Now fast forward to the end of February, 2015 (last Friday): the value of the same S&P 500 Index stood at 2,105! That represents a price increase of over 210% over that six year span. And, this doesn’t include the dividends you would have received for maintaining ownership during those years which represented approximately 2% more in return per year. Over that same time frame, the price of the small cap Russell 2000 Index grew from 343 to 1,233 (almost 260%)! Remarkable, but why is all of this significant? It’s enormously significant because of the lesson and reminder that it provides us all. Six years removed, it may be difficult to recall the exact feelings you had had during the crisis. But, I’m sure you can recall that it wasn’t peaches and cream! The media had a field day and relentlessly pounded the message that “this time is different”, and that it would take “decades” to climb out of this mess. How wrong they were, and how wrong they always are about bear markets. While they don’t feel very good while we’re in the middle of one, bear markets are a “normal” part of our investing experience. In the last 70 years, there have been 14 of them, and the average peak to trough price drop was 31%. That’s an average of once every 5 years. And, every one of them was treated as if it was the end of the world while it was occurring. The last drop of 19.4% came in 2011 when the euro imploded, the U.S. government was threatening shutdown, and the S&P downgraded sovereign debt for the first time in history. If history is any indicator, what this tells us is that another one of these “bears” is coming. However, please don’t take this as a predication that one is upon us or even approaching. Neither I nor anyone else has any idea when the next one will come. A bell will NOT ring indicating a bear market is about to kick in. There never has been a bell and there never will be. We simply want to be emotionally prepared. The good news about bear markets, which we’ve all just lived through, is that they have all been temporary declines wedged into the permanent historical advancement of stock market prices. The average “peak to peak again” timeframe of bear markets has been 40 months (3.3 years). This represents the time it took for market prices to rise back up to its previous high after a significant drop. During the next bear market, there will be pressure and temptation to forget this lesson and “sell” when signs of a bear market are in place. However, by the time it officially becomes a bear market, an average of two thirds of the total decline will have already occurred. In other words, by the time you decide to “get out”, you will likely have already suffered the worst. Here’s a recent example to illustrate all of this. In addition to cash you set aside in money markets and short term instruments to fund your spending needs over the coming years, let’s assume that you had an even $1 million invested in an S&P 500 Index fund back at the last market peak on October 9, 2007. Because you intelligently set aside funds to take care of your spending needs, you didn’t need to sell or even feel compelled to sell your S&P 500 Index fund shares over the following 17 months when the value fell to almost $440,000 on March 9, 2009 when the market reached bottom. This represented a 57% peak to trough drop, the largest broad market drop since 1929! You were tempted because the news was bleak, but you stayed with your plan and maintained your ownership of all your shares. Six years later, on February 28, 2015, your shares are now worth just shy of $1,350,000! Keep in mind that this was what took place after the worst broad market price decline since 1929! What can we learn from this about bear markets? Bear markets are psychologically challenging, but only to the degree that you believe they’re permanent (which they never have been). Trying to “time” bear markets, i.e. when they will begin and when they will end so you can “be out” at the precisely the right time, insures that you will end up worse than if you had just stayed the course. At any point in a bear market, it’s easy to “get out” and sell. The hard part is attempting to determine when to get back in. Decisions to buy and sell are not made looking through a rear view mirror. They’re made at individual points in time without any definitive knowledge about what’s about to occur next. A “bell” doesn’t ring indicating it’s time to sell, and then again when it’s time to buy. Finally, if you’re investing in the first place, you’re doing so because you need the investment returns provided by equity markets. Getting the full returns that equities provide is entirely predicated on our ability to ride out temporary bear market declines. The key lesson and strategy is that if (and only if) you’ve done your homework and prepared properly, then you have the structure in place to weather bear markets like we all experienced together back in 2008-2009, and maintain your financial confidence. I can’t begin to tell you the number of Relaxing Retirement members who have confided in me that they would never have been able to stick it out if they weren’t involved in our program. 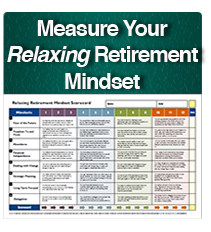 Doing your homework and adhering to a plan like The Relaxing Retirement Formula™ doesn’t insure that you will never experience temporary price declines. What it does is allow you to do is completely ignore the dominant media culture who will pronounce that “it’s completely different this time”, and respond to bear markets with full confidence that they’re normal and temporary, and not an event that leads you to abandon and dismantle your ownership of what you’ve carefully planned to provide the lifestyle sustaining income you need for the rest of your life.